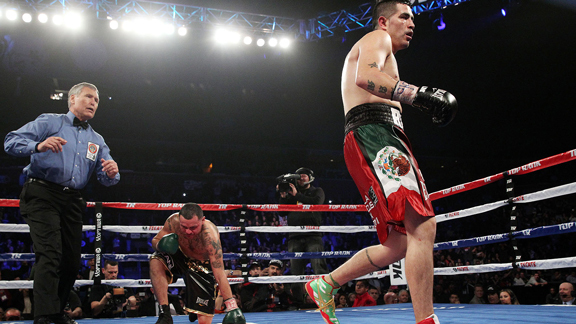 Brandon Rios defeated Mike Alvarado by third-round TKO to improve to 33-2-1 in his career. Brandon Rios's vintage display against Mike Alvarado pumped new life into his career -- and put an end to one of the greatest trilogies in boxing. BROOMFIELD, Colo. -- Welterweights Brandon Rios and Mike Alvarado, warriors in the ring who became friends outside it through their series of brutal fights, concluded their trilogy Saturday night as Rios destroyed Alvarado in a third-round knockout. 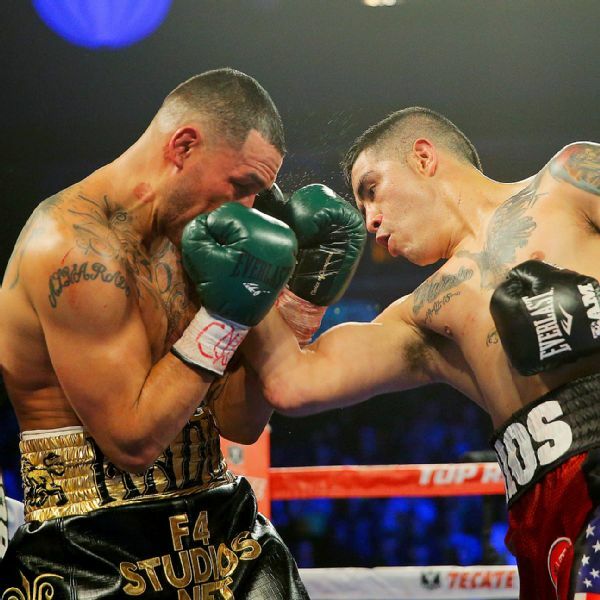 Fighting in Alvarado's Denver backyard, Rios took the hometown favorite apart with ease before a near-sellout crowd of 5,988 at the 1stBank Center. Referee Jay Nady waved off the fight on the advice of the ringside doctor, with a battered Alvarado on his stool and having vision problems after the third round. "It was my best fight ever," Rios said. "I did everything right in this camp. I was not going to let him beat me in the trilogy. I saved my career, and I answered a lot of questions." Said Robert Garcia, Rios' trainer: "Not only was it a win, but we trained to do what he did. He made Alvarado miss a lot, he was on his toes, he had head movement. It was the perfect performance. We needed it." Rios consoled Alvarado after the fight. He said he told Alvarado, "It's been a pleasure fighting you, and I love you like a brother. Get back on the right track." There was action, to be sure, but it was mostly one-way traffic as Rios won the trilogy 2-1 and stopped Alvarado for the second time. "It feels good. I won, and I showed I am here to stay. I'm not done yet," said Rios, who took the fight so seriously he arrived in Denver with his team, on his own dime, two weeks ahead of schedule, to complete training at altitude. "They say I'm not dedicated, I'm lazy, I have no head movement. But this was the best camp I ever had in my life." The first two Rios-Alvarado fights were classics. Not so much for the third one, as Alvarado, who lives a very hard life outside the ring, had nothing. "One would have liked to have seen an even slugfest and maybe a knockout in five or six rounds," Top Rank promoter Bob Arum said. "But it's boxing. It's up to the fighters. The promoter can't produce it like a Broadway show. "Brandon looked very, very good. Alvarado looked like he had very, very little. How much of that was Brandon, and how much was Alvarado? How could I tell?" Word circulated during fight week that Alvarado had only truly trained for the fight for two weeks or so. He was also dealing with legal issues outside the ring, as he faces another jail term following his January arrest for having a handgun during a 4 a.m. traffic stop. As a convicted felon, it is illegal for Alvarado to have a gun. "It was all in the preparation. I didn't train like I should have," Alvarado said. "I wasn't as prepared as I should have been, and I got what I should have got. I'll get myself out there again, and I have my marriage to look forward to, and my kids and I will be back." Rios, a former lightweight titleholder, and Alvarado, a former junior welterweight titlist, spent the first minute of the fight sizing each other up, and then it was on, as Rios began to attack Alvarado with combinations. Almost immediately, he hurt him and turned his face red. Rios had a huge first round, in which he outlanded Alvarado 29-6 and sent him back to his corner looking like he had nothing to offer. Rios continued to attack in the second round, and though Alvarado tried to fire back, he never got into the fight other than to land a terrible low left hand -- clearly not on purpose -- that dropped Rios in agony. Nady gave Alvarado a hard warning and Rios a chance to recuperate, but Rios won the action-packed round easily by outlanding Alvarado 39-10. By the third round, Alvarado's face was a mess, and he was taking huge punishment as Rios, who earned $850,000, ripped him with power shots and clean right uppercuts, one of which dropped Alvarado to a knee. Alvarado, who made $785,000, survived the rest of the round, and the doctor went to the corner to examine him. When Alvarado could not properly tell how many fingers the doctor was holding up, the doctor told Nady, who waved it off. "My vision was not there," Alvarado said. "I couldn't see. I'm not done yet at all. I'll be back." Regardless of what Alvarado said, the loss could be the end of the line for him. He has lost three fights in a row and could be headed to jail. "I don't want anyone to tell me to retire, so I'm not going to tell any guy to retire," Arum said. "That's his decision, but I thought he had nothing, zero. Brandon did everything he should do, and Alvarado came up empty." For the fight, Rios landed 120 of 290 punches (41 percent), according to CompuBox statistics, and Alvarado connected on only 20 of 87 (23 percent). Arum said Rios' next fight will be a big one. In October 2012, Rios (33-2-1, 24 KOs) stopped Alvarado (34-4, 23 KOs) in the seventh round in Carson, California, in an extremely violent junior welterweight fight. In an immediate rematch in March 2013, Alvarado, 34, exacted revenge in Las Vegas by winning a close unanimous decision and a vacant interim junior welterweight title, as he brawled early on and then boxed just enough in the second half of the fight to edge Rios, 28, of Oxnard, California, in another ferocious battle. Rios won his second fight in a row after losing both of his fights in 2013, to Alvarado and Manny Pacquiao, and being limited to one fight in 2014, after a failed drug test following the Pacquiao fight. When the fight ended Saturday, Rios climbed the ring post and shouted to the media section, "I'm back!" Later he said, "I am back. Everybody forgot about me. But I am back. I prepared myself very well. I am motivated to get back to the top. I didn't want my career to end now. I didn't want that to happen. I am still young in the sport, still have a lot in my tank. "I'm not f---ing around anymore. I am back to be dedicated to this sport. I am not going anywhere.